ContactWhere to buy Dauby? Please contact Bart. Are you dreaming of an industrial bathroom with matching accessories, but you don’t live in a Manhattan loft or converted biscuit factory? Do you like that robust architecture combined with raw materials – such as metal, steel and bronze – in your bathroom but don’t know where to start? Don’t worry, here at Dauby we have a variety of accessories in raw metal and raw bronze to meet this need! 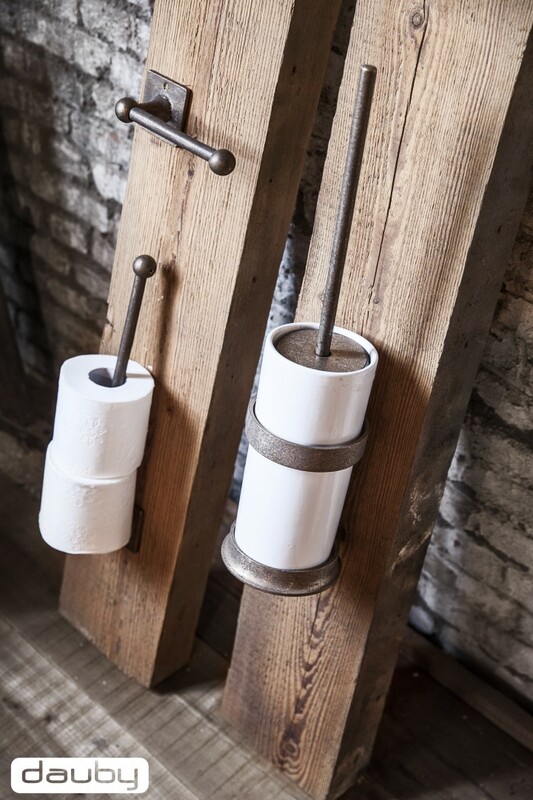 We are happy to help you find the right bathroom accessories to create that trendy industrial look and feel. 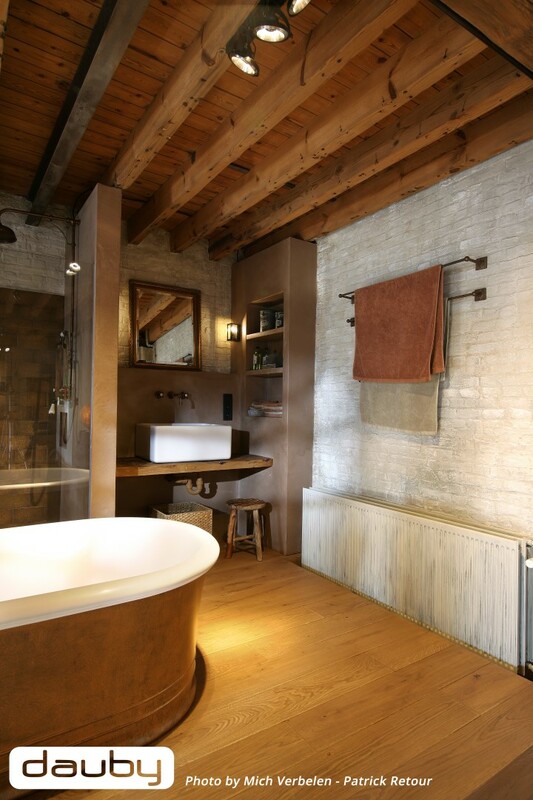 Original concrete floors; authentic brick walls with an uneven but sound underlayer; bathroom accessories in metal, steel or bronze … Every one of these creates the perfect basis for an industrial bathroom! After all, an industrial bathroom no longer hides raw and unworked building materials but instead proudly integrates them into the whole. Even down to the smallest details! Old buildings such as lofts, factories and workshops are rich in these raw, somewhat darker and unworked elements, which means they lend themselves perfectly to being converted into an industrial home. Does that then mean you can’t create an industrial bathroom in a newbuild home? Of course not. After all, the power of an industrial interior is that the design is rugged, habitable and functional at the same time, making the trend accessible for any home. One of the great things about the industrial style is that you can create maximum impact in your bathroom with a minimum of elements. Just consider our luxury Pure® Plus bathroom accessories that are unique for being cast in sand moulds for a rugged yet elegant style. In an industrial design, it is important not to over-egg the pudding: less is more. Taking raw metal, bronze and unworked wood as the base materials, there are a whole range of possibilities to create a finished whole using splashes of colour and accessories. Here at Dauby, we regularly work with accessories in raw bronze, raw metal and aged iron to upgrade your bathroom to an industrial look. See our collections and impressions here, a treat for your eyes! Is the basic style of your industrial bathroom rugged and untreated and are you on the hunt for bathroom accessories that are in keeping with the look? Then you are in the right place at Dauby! The Pure® Plus collection is an original Dauby collection, focusing on pure and simple design. The collection consists of natural materials that are cast using a unique casting process. Combine one of the various models of bathroom accessories with other unworked, rugged materials and the possibilities are endless! The Pure® Plus collection with its raw bronze and raw metal capitalises perfectly on the trend for industrial design. The combination of sleek designs and pure materials gives an unrivalled effect and timeless character. Raw Bronze is a unique material in Pure® Plus, because it is created in a special way. The rough, unpolished look only emphasises the warm, coppery tint. It is the purest form of bronze! This natural material can also be combined with an infinite number of other materials and colours. If you opt for Raw Metal, you are guaranteed to give your interior a rugged and industrial style. This material combines perfectly with natural wood, natural stone, etc. Nevertheless, the metallic trend is experiencing a definite boom and retro bronze and metal are also making their mark on interior collections with the metallic look that matches a rugged interior exceptionally well. 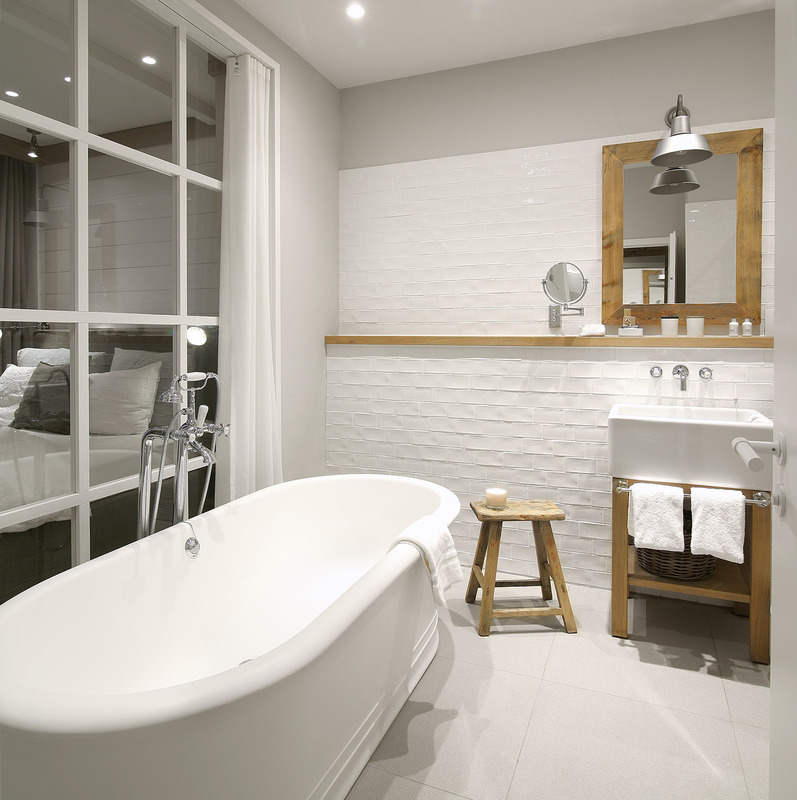 If you choose an industrial bathroom, you can choose sanitary ware with a square design or rough shapes. Would you like a bath in industrial style? Then choose a bath with more angles instead of curves. For a more traditional look in industrial style, choose rounded shapes but with a sleek and rough finish. Would you like to upgrade your existing bathroom and add a soupçon of industrial design to your furniture? Then use your bathroom accessories! These can be combined perfectly with existing elements to take best advantage of the industrial trend in your bathroom. Has the industrial trend captured your heart? Then Dauby is the place to go for advice on interiors and materials! You want to be kept informed about new products and updates?